I received this book as a part of a Book Review Programme by Blogadda. First things first! Who says that Indian authors don't write well. The standards of this book match to that of foreign authors. Ravi Subramanian- as his bio states on Goodreads, has been a banker and now a best selling author. For that matter, his stories revolve around the lives of bankers, including this one. This enhances my firm belief that a fiction can never be entirely a fiction, and is eventually real life plus some necessary exaggeration. Had the author been staying in a village, his fiction would have been based on poverty, sustenance, child marriage (a wild guess). About the plot- Its a thriller wherein the protagonist Shreya is the apparent antagonist. Aditya Kapoor has authored several bestselling novels and also is a successful banker, an IIM Bengaluru passout. He leads a near perfect professional and personal life at 40 something, with a high rank banking job, a writing career and a loving wife and son. That's when Shreya steps in their lives as a fresh Management trainee from his alma mater. She is recruited by Aditya and his HR friend Sanjay for his bank. She is a psyco, cold blooded, muti-faceted, extremely attractive, obsessive girl, who is a voracious reader and aspires to become a bestselling author like Aditya, whom she uses to get her dream come true (my discreet biasness right from the first few chapters against her ). She goes to the extent of seducing him with her youth and leading him to an extra marital dalliance, showing no signs of guilt. Sanjay has an important role to play in the whole span of the story. Unfortunately, I can't disclose everything here, since that would be unfair. The rest of the story is about the romance, conspiracy, trust mistrust, lie truth, heartbreak, adultery, fame, suffering and the tables turning at the end of it all. All it lacked is background music! Looking at the cons of the novel- It is very lengthy, with 392 pages from cover to cover. Shreya and Aditya's romance could have been cut short as per me. Aspiring writers can relate well to the process of book writing, publishing and marketing covered throughout. The crux of the whole plot is skewed in the last 75 pages, every moment of reading which was breathtaking. Aditya's speech at the end stole the show. An alternate title could have been- "Victory of Good Over Evil", based on the obvious and inevitable happy ending. The author has spun the story very well, accompanied by rich vocabulary. The cover page reads- SOON TO BE A MOTION PICTURE. I must say this book deserves to be a motion picture, however, it requires some more mirch masala (and cutting short the intimate scenes) in order to expand the audience base. 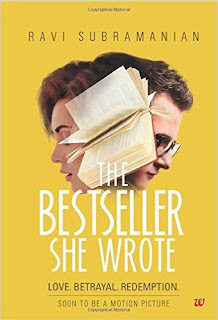 My verdict- Overall, I would rate it as 4 on 5 stars and recommend it for any of those who are interested in thrillers; have the capacity to read a thick book; are aspiring writers; have the wit to relish smart plots; some scenes on adultery don't bother them and who want to learn to understand the sour facet of the human race.